It took 11 months for its price to climb by 68%. Then it only took two weeks to give back 28% of that move. Welcome to the wild and wonderful world of crude oil. A barrel of West Texas Intermediate is trading around $65 today. The three-year outlook is bullish. The geopolitical backdrop is fragile. Many believe $80 and $100 per barrel is in the not-too-distant future. So, you’re wondering when it is safe to buy back into crude oil. My short answer: Not yet. I expect a new sell-off will take the price down through $60 per barrel in the next four to six weeks. Then crude oil will be ready for a run to $80. And even higher. Of course, to say this correction can go deeper is to say there is good reason for this correction. My colleague Matt Badiali has been all over this oil bull market. I see what he sees, and I agree with his forecast: much higher prices for oil because geopolitics, demand growth and underinvestment will leave the market out of balance. Many others see that too. From a contrarian perspective, that’s good reason for traders to take the bearish side of the trade. Talk of future demand declines in India and China due to high prices. Saudi Arabia’s and Russia’s willingness to suspend OPEC production cuts and increase production as needed. These are not game changers in the longer term. They’re not even that surprising. But they hit the crude oil market just when it had looked like a good investment. And I think there’s more downside where that came from. The Commodity Futures Trading Commission releases a weekly report called the Commitment of Traders. It reveals how the three categories of futures traders (small investors, commercial traders and large speculators) are betting on an underlying asset. I care mostly about the “large speculators” category. Their extreme, one-way bets are a good contrarian indicator. 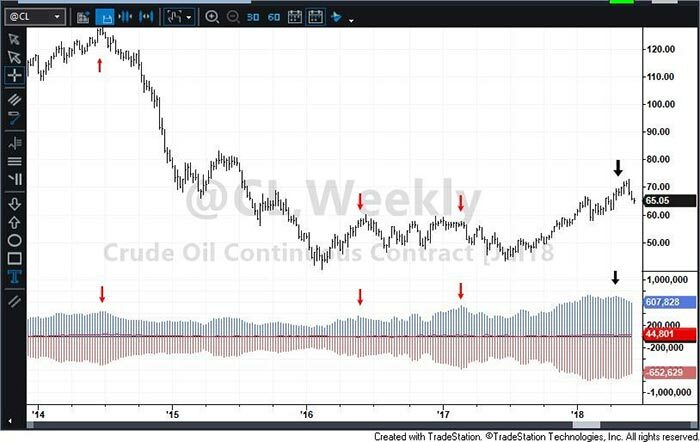 The blue histogram at the bottom of the chart below shows that large speculators became more bullish on crude oil this year than at any time in the last four years. Previous extremes did not bode well for the price of crude oil and the speculators underneath it. Double-digit price declines ensued. The same thing is happening now. And the move isn’t over yet. Monitoring the large speculators is not a precise timing indicator. But it’s a valuable piece of information to use with price indicators and trend analysis. Together, that’s how to determine when it’s the right time to bet against the crowd. Crude oil could fall another 8% to 10% in the days and weeks ahead. If you want to try to make money betting on that before the bulls return, short-term traders might consider the VelocityShares 3x Inverse Crude Oil ETN (NYSE: DWT), designed to profit three times as fast as the price of crude oil falls. For example, if you bought DWT when crude oil’s 11% sell-off began on May 22, you’d be sitting on a better-than-30% gain in just two weeks! I should mention leveraged inverse products like DWT are not meant for holding over extended periods. They are ideal for targeted, speculative bets that last no more than a few weeks. If you prefer to wait for a buying opportunity and ride crude oil up to $80, you might instead consider the United States Oil Fund (NYSE: USO). Editor’s Note: On June 12 at 1 p.m. EDT, legendary investor Paul Mampilly will step forward and reveal his most closely guarded moneymaking secret. It’s a strategy he has personally used over the last 20 years to snap up gains as high as 1,264% in as little as 10 days. Paul has never shared any details about this strategy with even his highest-paying hedge fund clients … but on June 12, he will pull back the curtain and reveal the fastest wealth-building tool in his arsenal. To claim a VIP access pass to this landmark online broadcast, just click this link here.